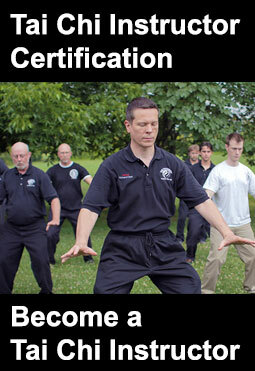 Clear’s Tai Chi is a results based accelerated learning program. We promote a 1 on 1 “hands on” method of instruction in large part because the only way to continue to advance as an instructor is to continually work with your students. Hands on. 1 on 1. A Clear’s Tai Chi instructor is versed in the basic forms, self-defense applications, qigong & internal principles of Tai chi and is qualified to teach beginning Tai Chi classes. A Clear’s Internal Push Hands Instructor is well versed in the fundamentals building internal skill and the application of that skill for health, healing & self-defense. Study Materials: Internal Push Hands Instructor Course – Available on DVD Feb 18 or Live at a workshop. A Senior Clear’s Tai Chi Instructor has a thorough understanding of Intermediate Tai Chi principles, fighting applications, Nei Kung & Qigong. You are qualified to teach intermediate Tai Chi classes. 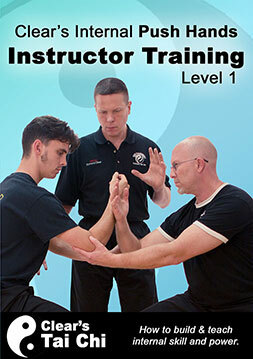 A Senior Push Hands Instructor is adept in the use of Internal skill & energetics for health & self-defense. 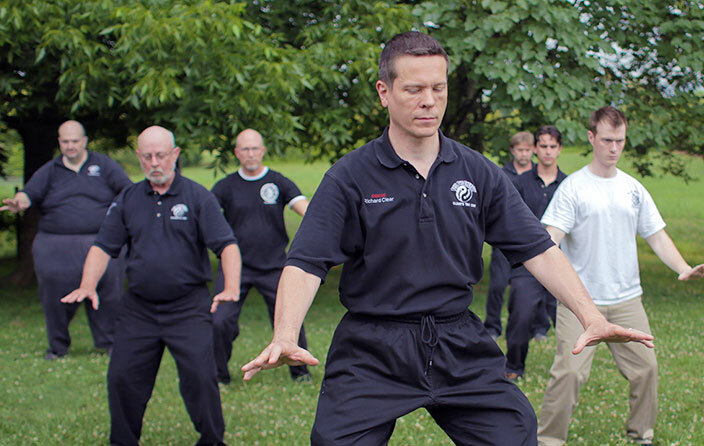 A Clear’s Tai Chi Sifu has advanced skill and a deep understanding of the combat side of Tai Chi Chuan. A Level 3 Push Hands Instructor has advanced internal skill & is fully proficient in the self-defense use of push hands, internal principles and energetics. 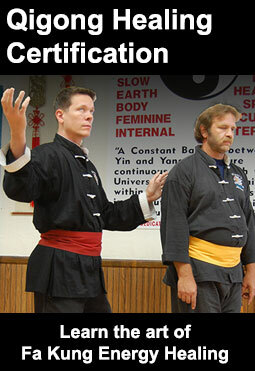 A Master Instructor is highly skilled in advanced internal and energetic principles. I know that results depend upon the individual and how hard they work at the curriculum, but about how long does it take to complete the Basic Level Tai chi program to be able to get a basic level instructors certification? It depends on how much previous Tai Chi training you have. If you’re already familiar with most of the basic principles it can take as little as 3 months. If you’re new to Tai Chi and work hard it shouldn’t take more than a year. also have you book marked to check out new information in your web site. Is the Basic Skills Instructior the 24 pattern? Also, is this the one most practiced around the world? Thank you. Actually we have found that the best way to teach the principles of Tai Chi at the beginning level is with shorter sets. That way people can learn real skills instead of focusing on choreography. This also allows you to practice many skills every day, since the sets only take a few minutes to complete. The Basic Skills course comes with Clear’s 8 & 13 move sets. These sets are very easy to learn, especially if you already know another form. Learning our method will allow you to apply the skills to any form you like, but most people who learn our system prefer our forms for the reasons mentioned above. I see that most of the testing says that it’s live. Is there a specific time and place that that is done? Or is it done in different locations? When live testing is necessary, it will need to be scheduled with any of our qualified instructors. If you are testing here at our National Headquarters, you can normally make arrangements to schedule the test around any of the many workshops we put on. Is any of the testing ever done online? Yes, Tai Chi Level 1 can be tested by video. From there on out, the skills must be tested by feel. This will require getting hands-on time with an instructor who is certified at the appropriate level for your test. Is there a testing fee once one is ready to test for the various levels of Taiji certification and if so, how much is it? Different tests can have different fees, as they require different levels of scrutiny on the part of our trained examiners. That said, the Taiji tests are most typically $150.